Autumn has arrived and the summer holidays have been and gone, its time to look forward the autumn leaves dropping and Christmas approaching. It is one of my favourite times of the year I love the change of the season, the leaves turning orange and red, and of course Halloween. I wanted to talk to you about collaboration, we at Cross Accounting Service could not have enjoyed our success over the years without building up and keeping in touch with our wide network of colleagues and friends. So I wanted to share this bit of good news with you. For my industry being an Accountant in what is a highly competitive market, there are literally hundreds of accountants in my area of South Wales. I keep an eye on who is the competition and who is setting up in my area. I thought about 2 years ago, what if I don’t offer all the services my clients, or potential clients want, who could I talk to that does? I needed to connect with a larger company than myself who had access to a wider range of services that maybe my company doesn’t offer, and vice versa a company that would refer back to me in return. I found that very company, not only do I have someone to pass on work that I myself don’t do, they also send over work to me, what a great arrangement, they are also a great sounding board for me which I value very much. My other network contacts, we meet regularly for lunch, not only do we have a great synergy with our businesses, but that wider network will refer to you if they get to know you, you will find work in places you never thought you would hear from. In these times of high competition it is important to share the word about your brand and business, you cant do it all by yourself it will just take far too long. So go on take the risk, build up that network, make an arrangement with a competitor, you never know where it will take you. 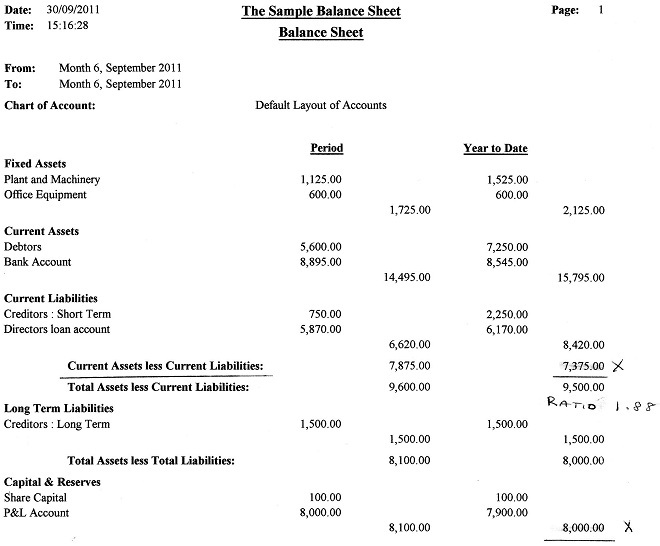 We covered looking at your balance sheet some time ago, and wanted to refresh you on why it is so important. Building up your balance sheet can help you with your future with the business, if you were ever to sell your company on to a potential buyer, this is an important area that the buyer will be looking at. Its not just about profitability and turnover, the balance sheet is an indication that you are growing your branding, a business that has thought about strengthing and building up the balance sheet is worth considerably more than one that focuses just in the present. ie turnover and profit. The example we have below, is fine for a small business and will probably have a good credit score as its positive in both the net current assets (Working Capital) and the overal value. But if youre talking about a business thats worth selling you are going to need a plan, this could be a 5-10 year plan, its certainly not short term. Will need to be assets in both the fixed assets sections and current assets, this could be by buying equipment or machinery to make yourself more efficient and do a higher volume, buying a company with skills or equipment that brings Goodwill into the assets section, quite a lot of larger companies do this, they purchase mailing lists, and client lists, from smaller companies, to rapidly increase their net worth, and increase turnover. Current assets would be building up your turnover, and therefore your debtors increasing. Keeping an all important eye on the costs, and keeping the creditors to a reasonable level. Long term liabilities are usually loans that are paid more than one year ahead, and maybe the director loans, if the owner hasnt taken back all of their investment. The balance sheet value needs to increase tenfold, and self sacrifice for the owner is a must for this kind of exercise. Its not all about your current year anymore, but your long term future, and future sales opportunity. Think of it as a potential pension plan? Investment for the house by the sea, whatever your dream future this is your opportunity to make it a reality.